Our thanks to Steve LaPierre for this California Aircheck video of one of the greatest Top 40 jocks of all time!
. . . people are sayin' this is the best voice-tracked show in the country . . . 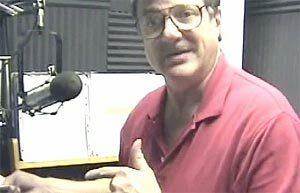 In this 2005 video, Jack Armstrong (d. March 23, 2008) is seen from his home studio in Greensboro, North Carolina. He's connected via ISDN and working with engineer Kevin Carr at WWKB in Buffalo, New York, recording his radio show. Jack explains this process, called "tracking", where the he records only his presentation, and it's then mixed remotely with the other elements of the program. It's obvious that the booth where Jack is working is small, limiting what could be captured visually. During most of the video, Jack's back is to the camera, so we've added some still photos during his on-air performance, and an animated transcript of his famous "sign off" at the end. Video from California Aircheck Video #97.